GSC has just announced that the re-release of Touhou Project duo from Scarlet Devil Mansion: Nendoroid Izayoi Sakuya and Nendoroid Flandre Scarlet are available for pre-order starting yesterday. The head maid of the Scarlet Devil Mansion is being rereleased! The much anticipated rerelease of Sakuya Izayoi from the Touhou Project Nendoroid series is on its way! Sakuya comes with three expression parts, a tea-set and a knife as extra parts, allowing you to pose her in a variety of different ways. Pose her working hard as a maid in the mansion, or instead pose her in battle, ready to throw her knives! It’s a Nendoroid that any Touhou Project fan is bound to enjoy! The little sister of the Scarlet Devil Mansion is being rereleased! 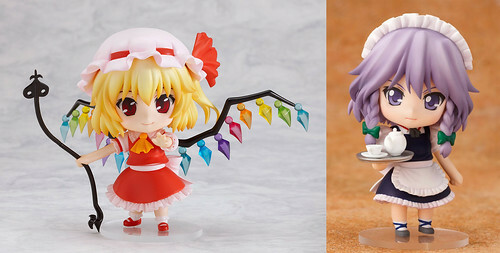 The much anticipated rerelease of Flandre Scarlet from the Touhou Project Nendoroid series is on its way! She comes with three expressions including her standard expression, a childish, innocent smiling expression as well as the grinning expression that shows off her devious intentions to destroy everything around her. Her trademark wings are also included, shining with all the vibrant colors of the rainbow! Anyway, the re-release of these Nendoroid duo is scheduled for August. Since I have just missed the pre order dates, will I be able to get these anytime soon or will I have to wait until the next re-release?